The lift to drag ratio of a rotorblade is an important parameter, and a high ratio is, of course, desirable. In helicopter operations, the rotor speed is more or less constant, so the most important influence on both lift and drag is the angle of attack of the blade. The lift to drag ratio as a function of the angle of attack is shown in the next figure (symmetrical airfoil). 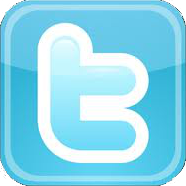 Clearly, there is a maximum lift to drag ratio at which the airfoil operates most efficiently. 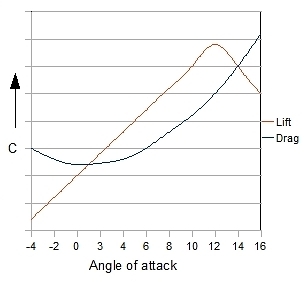 Increasing the angle of attack further leads to more drag and more lift, with drag rising more rapidly than lift. When the blades reach stall angles, lift will rapidly decrease leading to no lift at all and a lot of drag; a circumstance to avoid. Another important aspect which is related to the lift to drag ratio is the total reaction force of the blade. This is the force that, for the sake of convenience, we will separate into the two components of lift (orthogonal to RAF) and drag (same direction as the RAF). 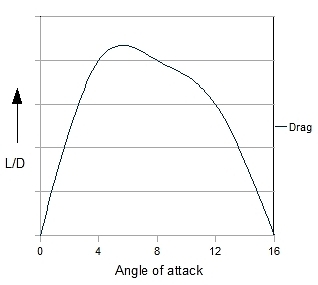 The figure below shows the reaction force, divided into the lift and drag components, for several angles of attack. This reveals that the angle of attack has a significant influence on the angle of the reaction force, measured relative to the plane of rotation. When the angle of attack is near zero, there is no lift. 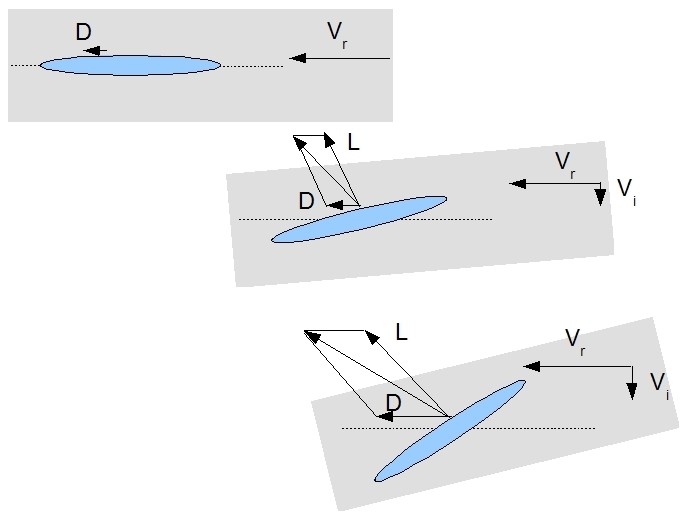 As drag cannot be zero (with a rotating blade at operational RPM), the reaction force vector will thus be almost parallel to the plane of rotation. When the angle of attack increases, lift rises rapidly and drag rises slowly. This results in a vector that will point in an increasingly vertical direction, ultimately coinciding with the angle of attack which corresponds to the maximum L/D ratio. Increasing the angle of attack beyond this point will make the total reaction force lean backwards and again become more parallel to the rotordisc. L/D ratio is also influenced by induced flow. Induced flow changes the angle of attack. The lower the induced flow, the greater the angle of attack. Hence, L/D ratio improves with less induced flow. This effect can be observed when a helicopter goes into forward flight. In the hover there is no airspeed relative to the helicopter. When it is in forward flight, air speed rises, which causes the inflow angle to reduce (the air speed adds to the rotor speed) while the induced velocity remains the same. Another way of describing this is to say that the angle of attack increases, and consequently so does the effectiveness of the rotordisc. This is the reason why a helicopter pilot has to lower the settings of its collective in order to maintain a constant (and in this case low) altitude when going into forward flight.